The Three Peaks are the symbol of the Dolomite UNESCO World Heritage site. Auronzo is the only town from which the south faces of the Tre Cime are visible. From Misurina you can see their south-west faces which conceal the Cima Piccola peak. If you want to get a glimpse of the world famous north faces you will need to go for a walk along footpath number 101 which takes you from Rifugio Auronzo at 2333 metres to Forcella Lavaredo at 2454 metres in around an hour. Here you can see Cima Piccola (2857 m), Cima Grande (2999 m) and Cima Ovest (2973 m) in all their glory. 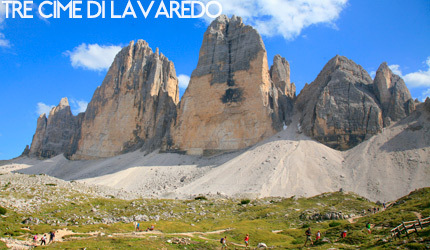 From Rifugio Lavaredo (2344 m), on the other hand, you can observe the sharp faces of Mt. Spigolo Giallo, a paradise of sixth grade climbing and a rock gym for the best mountain climbers. Some of the great historic and modern Alpine climbing feats have taken place right here from the first ascents of Cima Grande on the 21st of August 1869 by Vienna based Paul Grohmann. Other eminent world climbing names have left their mark on Lavaredo: from Innerkofler at Dulfer to Comici at “Sassoni” and Alexander Huber. There is an extensive network of footpaths and routes for every sort of walker around the Tre Cime and a number of equipped routes and vie ferrate which give you the opportunity to get to panoramic observation points such as the Cadini massif and Monte Paterno. Some of the most beautiful Dolomite mountains are visible around the Tre Cime and from the convenient vantage point of Rifugio Auronzo. As well as the Cadini massif and Mt. Paterno, the Cristallo, Croda Rossa d’Ampezzo, Dolomiti di Sesto, Croda dei Toni, Marmarole, Antelao and Sorapiss massifs are worthy of note. And at your feet are Lake Misurina and Auronzo’s Lake. - as well as on foot, in the summer you can easily get to the Tre Cime by car on a tarmac road with a fee paying car park. Turn off SS48bis in Misurina and climb up 7 kilometres to Rifugio Auronzo. - in winter you can walk up to the Tre Cime on permanently groomed tracks with snowshoes, by ski mountaineering or on a snow cat from Lago Antorno.